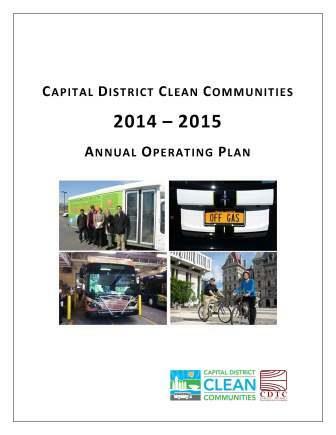 The Capital District Clean Communities Coalition released its 2014-15 Annual Operating Plan. The Annual Operating Plan is a narrative of the Coalition’s accomplishments over the last year and progress towards achieving the goals set in the 2013-14 Operating Plan. It also lays out a set of new goals for the upcoming year and beyond. The coalition is most proud of their ever-expanding outreach activities that have ranged from day-long workshops to new websites and utilization of social media tools. Over the next year, CDCC hopes to expand its membership and increase petroleum displacement through new fleet adoptions of alternative fuel vehicles (AFV) and assisting members in expanding their AFV fleets. The CDCC would love to see an uptick in biodiesel use in the Capital Region and plans to explore barriers and be a resource for interested fleets.